The Piusi MC Box Fuel Management System has the capability to control and manage the consumption of fuel for users in the private and commercial sector at a low cost. 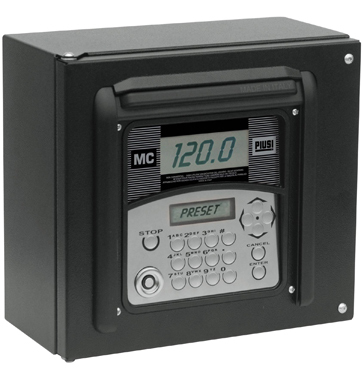 The MC Box is the perfect fuel monitoring solution as an ?add on? unit for new or existing pumps, or where it is preferable to have the pumps and the control panel installed in two different places. This Piusi fuel tank management system consists of a dedicated multi-user panel incorporated in a weatherproof lockable casing, that is capable of recording the date, time and amount of fuel dispensed for the last 255 transactions. It also has fuel security features by only allowing authorised users to dispense the fuel from the diesel storage tank. These fleet fuel management systems are available as a version that controls up to 80 users and a version that controls up to 120 users. The Piusi MC Box fuel pump monitoring systems are able to be controlled at the unit via a pin code or a magnetic key system, and using the additional Self Service Desk fuel management software can also be connected to a PC for viewing the transaction data. For more advanced software look at the MC Box Self Service 2.0 system.